Now it begins! The holiest and most sacred time of the year as we gather to remember all that Christ Jesus has accomplished and what it means to us. We begin today a week which is called “holy” and rightly so. We gather in churches throughout the world to enter into the passion, death and the resurrection of Christ. Today, Palm Sunday is the starting point. We hear the story once again of the passion and death of Christ. Why would Jesus allow himself to suffer death by crucifixion? Why did he submit to such a horrendous ordeal? Jesus speaks a three‐fold message to us. First, Jesus says he loves us: “No one has greater love than this, to lay down one’s life for one’s friends.” Second, Jesus says we should love one another: “Love one another as I love you.” Finally, Jesus says love entails suffering: “Whoever wishes to come after me must deny one’s very self, take up his or her cross and follow me.” As we enter this Holy Week and celebrate the Sacred Three Days, (The Triduum)—Holy Thursday, Good Friday and Easter, may we learn and feel the tremendous love God has for us! As you heard the great news last weekend, we are very close to our goal of $710,000 for the renovation of “St. Francis Hall: A Space Renewed.” I am getting more and more excited about the possibilities opening up to us when this venerable building will become a more inviting, functional and beautiful gathering place for our parish activities and for important events in our parishioners’ lives such as weddings and quinceañera celebrations! If you would like more information or wish to contribute, please do not hesitate to call the parish office. Many thanks to all who have donated thus far—from every culture and background in the parish! We are truly a blessed multicultural community—one parish, many cultures! In closing, I invite us all to pause this week from business as usual and take the time to participate in all the amazing and inspiring liturgies commemorating the Lord’s Passion, Death, and Resurrection! As is our custom, at the Holy Thursday Mass of the Lord’s Supper, anyone wishing to take part in the moving foot washing ceremony is welcome to do so. There are several services on Good Friday: At Noon, the friars will present reflections on the Last Words of Christ; at 3:00 p.m. the Solemn Liturgy of the Lord’s Passion and Holy Communion takes place in the Serra Center. 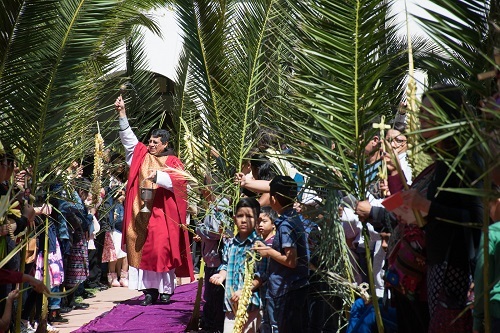 The Hispanic Community will present a stirring outdoor Way of the Cross at 5:30 p.m. Then at 7:30 p.m., we celebrate the Multicultural Liturgy of the Lord’s Passion and Holy Communion. Then, on Holy Saturday night, all are especially invited to take part in the Glorious Easter Vigil Mass—the climax of the Church Year—during which many adults and children will be welcomed into the Church through Baptism, Confirmation and First Eucharist! A long Vigil for a lifetime of blessings. Parents with children are encouraged to attend the special Masses on Easter morning for the Children’s Procession and delightful children’s homily! These Masses are at 11:00 a.m. (English) or at 1:00 pm. (Spanish). Please see the bulletin for the full schedule of Masses this week as some of the times have changed slightly to enable more people to attend Mass comfortably. May God bless you and your loved ones as we celebrate this high point of the liturgical year!